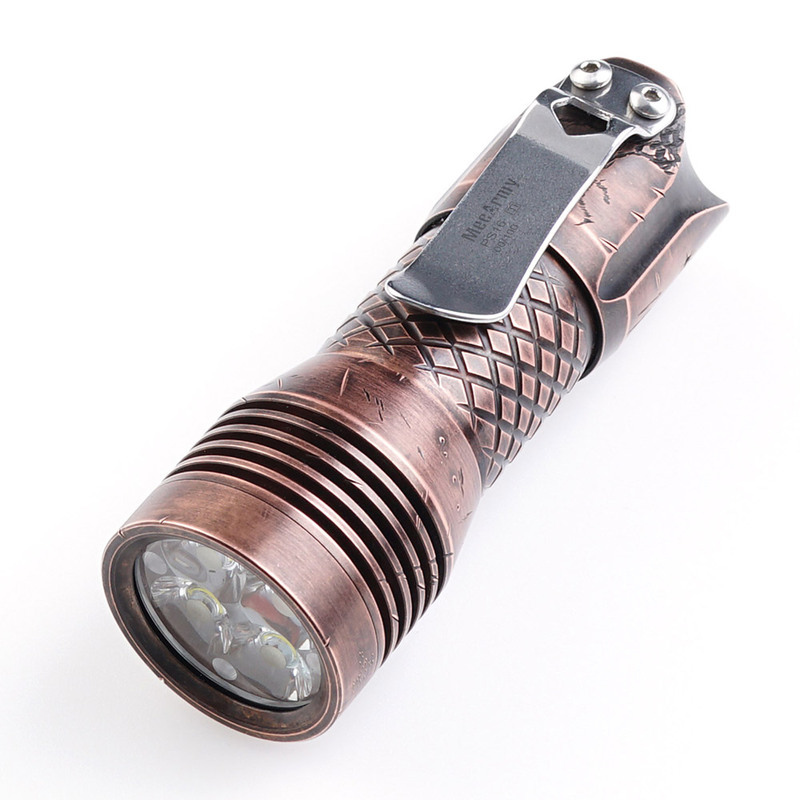 ACEBEAM TK16 copper is the new single button EDC lamp. This flashlight is available in 3 different LED options: 3xOSRAM ; 3xLUMINUS SST-20 CRI95; 3xCREE XPG 3. An ultra-long beam distance of up to 338meters by 3xOSRAM is perfect for long range spotting as well as intense search and rescue operations. 3xSST-20 CRI95+ LED version has a 95+ rating, illuminates colors more naturally, revealing more details to a user. A stunning output of up to 1800-lumens produced by 3xCREE XPG 3 LEDs greatly meets the needs of outdoor lighting. Not only being compatible with rechargeable IMR16340 550mAh battery, but also suitable for CR123A battery. Comfortable and firm grip with ergonomic knurling allowing the user to operate the tailswitch naturally without even looking at it. The slim head design, solid raw copper body with a gold plated pocket clip makes TK16 easy to carry around on the pocket. Nice looking flashlight! Very nice that it has a tailswitch and some interesting led options. That’s a very nice light. IMHO it should also become avaiable with a longer (lasting) 18650 tube. Because a 550 mAh 16340 battery in a triple flashlight lasts about as long as: tik-tik-tik-gone. Compared to other lights the price (MRSP) on the Acebeam website is even quite reasonable. Niice light. But unless a 18650 cell in there. It would be a tic.tic.tic gone. I have a coupla 123A and 16340 cell, torches. and use them at high output ranges. Just a bit more length and make a nice toy into a decent torch. My Astrolux S41 Cree leds. Copper head std tube. The Stainless one with 18650 tube. Nichia Quad. One of my fav walkabout lights. It’s all in the battery with those baby torches. 16340 battery for 1800 lumens sounds a bit weird i mean why not just use 18650 ?.. i find that even for my s1 baton that does 500 lumens max the highest 16340 doesnt last long … otherwise looks like a neat light. Looks great. Wish it was 18350 compatible. 16340 has too little capacity. Is this the first commercially manufactured light with the Osram emitters? These tiny pocket rockets are great for keychain lights. Who carries 18650 sized keychain lights!? Like, with your keys, on the keychain, 18650.. That’s EDC sized. Of course it would be great to also offer the larger sizes. Does it even have a keyring attachment? This should be considered a wee backup light. EDC for me— but I would gladly carry such a beauty! 3xOSRAM Yes, IMR16340 550mAh Not enough. I will wait for 18650 and wish I had this one too. Make it 18650 for longer run times. I’ll probably buy the darn thing. Copper is my weakness but, why oh why oh why, 16340? Let them die already!!!!!! The cells, not Acebeam. I’m sorry but I don’t believe it. A claimed 90 sec runtime on 1800 lumens turbo from a 16340 cell? Both lights when running on max output step down after 10-15 seconds. They both claim similar runtime of around 90 seconds but don’t even come close! Lol, a commercially available CR123 copper pocket hot-rod triple with a flashaholic choice of emitters and people are complaining about what it’s not. Negativity is this forum’s enemy people, variety is it’s friend. I’m not a 16340/CR123 person but am still very tempted by both the Osram and the SST-20 versions. Thanks Acebeam! Oooh that’s new and we likey……………… but immediately we want MOOOOAAAARRRRR!!!!! Nice light, love 16340. RSP? 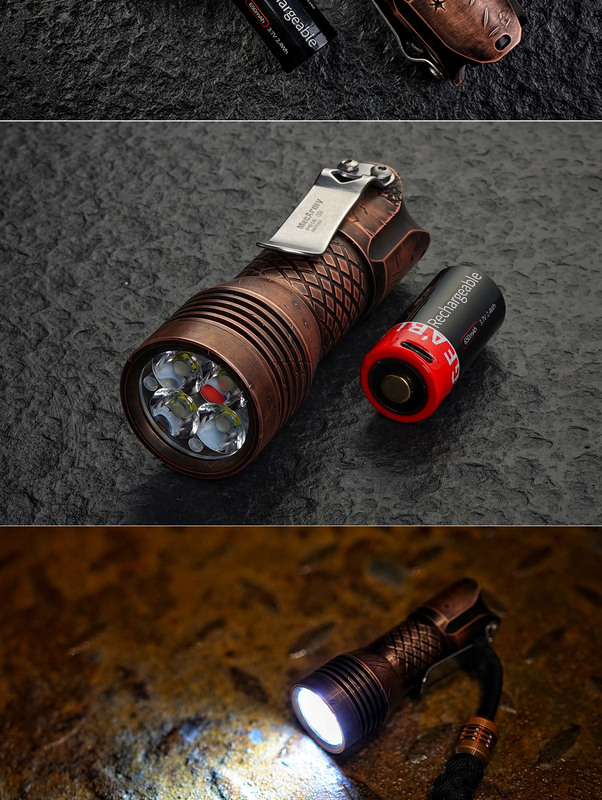 I think it looks really interesting, and I can see myself buying one, albeit I wouldn’t use it for “intense search and rescue operations.” There are other, much more suitable flashlights for that. That said, I was expecting a higher price. The MSRP of ~$87 is a bargain for an all copper triple, IMO. There are other copper triples that use short battery tubes which retail for many times that. When will the flashlight be available for sale? How is eco mode enabled or disabled? Is the tail switch mechanical or electronic? What tint of light, cool, neutral or warm, will each emitter produce? And c’mon, you know you’ll use your 16340 EDC for all of your “intense search and rescue operations”. What else would you use? lol an X70? Don’t be silly! That’s for finding stuff under the couch! I want to buy it, but make it 18350 compatible. Coupons for early implementers to try out, review and give people who are “on the fence” posts to find when they do their research? I like it, available yet? For those that want 18350, you can get the Mecarmy PS16 Copper Scar . It’s also quad emitter instead of triple but is much more expensive. The XPG3 emitter is not that good though. “Battle worn” finishes are tacky. I like to put my own battle scars in my stuff. Also, that price just goes to show what I said earlier, that the TK16 price is a bargain.